How to structure your budget is a must-learn for any aspiring or experienced filmmaker. We know many of you are great at the creative side of filmmaking but unsure how to Structure Your Movie Budget and finance movies efficiently. Let's say you have a script, you have all the creative energy, and you're getting the financing you need. Everything seems to be lining up and going great. Until you are faced with how, exactly, your movie's financing will be spent and how you'll explain it to potential investors. Budgeting while creating a movie is stressful and something many creators dislike-after all, the last thing directors or screenwriters want to do is sit down and figure out how much money it is going to cost. However, understanding your budget by creating a detailed breakdown structure, is one of, if not the, most important steps to indie filmmaking. Once your film budget is structured appropriately-even if it's a low-budget film-you'll be able to spend more energy and time on the things that matter, like directing or producing. Before you budget for anything else, make sure you budget for your actors. Paying your actors is a big must, and, if you have an experienced actor, you need to make sure you pay them accordingly. By the time you sit down and actually budget your whole movie, you should have your actors cast. That way, you're able to figure out just how much your cast makes, including SAG hires. If your actors are not paid, or don't earn what they're worth, this could leave them unhappy and possibly even lead them to not doing as good a job as when they are at peak performance. This could mean actors do not show up to work on time, something very common to unpaid workers, or their creativity or skill level could drop. That's why making your actors a priority is one of the most important things you can do. Maybe the second most important aspect of your budget should go to your camera equipment and all the equipment you need to produce high quality material. Trust us, if you try to use the cheaper alternatives in areas like sound equipment, it'll be noticeable to all viewers. Once you structure your budget around your cast and crew, look at your remaining balance that can go towards your equipment. Of course, there are always ways to find great deals when renting materials like cameras. A lot of people, with the necessary networking and connections, find themselves getting deals others don't on camera equipment-all because of those very important connections. We know you've heard this one before, but it's worth repeating again: connections are everything. A lot of the time, first time filmmakers get caught up in paying actors, the crew, and everything necessary to making the film-but then don't take into consideration what they need for post-production. Post-production does cost and it should always have a high place when you're first structuring your movie budget. By thinking of the costs that you will have in post-production, you're eliminating the unease that comes quite often when filmmakers realize they don't have the money they thought they did for everything in post. Things like facilities, equipment used, and staff are very important to post-production, but every situation varies. Just make sure that you keep it in mind when first structuring your budget. The remainder of your film budget can go in a variety of different areas. Publicity in all its forms and varieties, advertising, distribution, you name it. People like attorneys should also be included here, as you may need some legal help in an array of different ways-and we always recommend getting professional help in regard to legal issues or contracts. Festivals and all publicity costs should be structured here as well. Again, just like post-production costs, it is much easier to budget prior to even making the movie, even though things like distribution and advertising are probably far from your mind. Setting aside a budget just for these areas will make your overall filmmaking experience flow much smoother than it could if you don't plan accordingly. On set, overtime tends to be more common than not. Pushing through to get things done for the day is much easier (and even cheaper) than filming an extra day, even though everyone is paid time and a half. Make sure you have a section of your budgeting breakdown structure that accounts for potential overtime during the shooting of your movie. Trust us, by budgeting for it now, you'll be thankful in the long run. If you find yourself filming with the potential of running into overtime, there's no longer that need to rush. When you have a budget for overtime, you can work more freely. Planning ahead for contingencies is always recommended, but hardly ever really enforced in a lot of indie filmmaking. We all know this. Things can go wrong. If you plan accordingly and have a little cushion room in your budget for when Plan A doesn't work, the whole filming experience will immediately feel a bit more comfortable. Don't regret not having a little bit of budget left for when everything goes wrong - because when you don't think two steps ahead, things tend to fall apart and become that much harder to succeed. Want to open a brand new blank document and get started? Or would you rather start with 100s of line items filled in and an actual film budget template used for prior production? 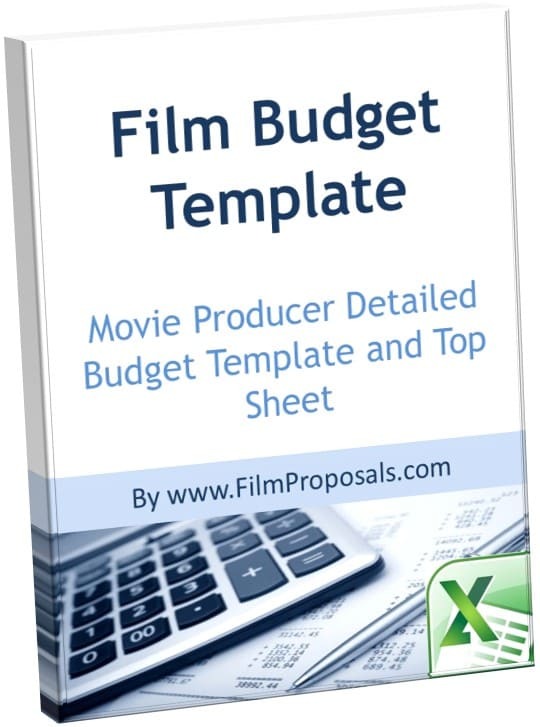 Our Film Budget Template is included with Film Financing Packages #3 & #4 - The Film Budget Worksheet Template is in Excel, fully editable and contains 100s of line items and formulas ready to be completely customized to your film production. If you're looking for ways to get started with the financial aspect of your independent film, our Movie Investor Toolkit helps you every step of the way. The Excel Financial Projections template does a lot of different things to help with the financing of your independent project. You can compare your own movie to other movies by budget and genre, deeply analyze your movie and its potential movie costs, and allow yourself, quite easily, to add or delete financials into your business plan. The Financial Projections Template is one of the easiest ways to get an overall picture of your movie. It also helps you project all of your financial worries, making it incredibly helpful for your overall budget in the long run. What's more, it's actually incredibly easy to use. All you have to do is fill in all of your data or numbers in the yellow cells and the template will do all the work for you. You never know, your independent film could be the next big motion picture to hit the screens.